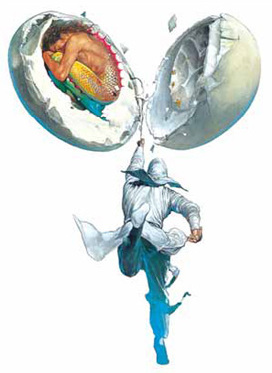 Cartoonist Chen Uen's works are mostly kungfu-themed. The two-volume graphic novel Abi-Sword, a martial arts epic infused with exceptional calligraphic brush skills, is being re-released 18 years after its creation to appeal to a more international audience. The simplified Chinese edition was launched in Beijing last week. Chinese-language students American Benjamin Hose and Greek Vahe Abrahamyan were impressed by the promotional poster, which is a collage of pages from the series. Hose, a self-styled comic fan, explains that it was his first time to see comic books drawn in such a style. It was the unique paintings of illustrator Chen Uen () - created using calligraphy brushes, toothpicks, toothbrushes and cotton swabs - that won him a 1991 Best Series award at the Japanese Cartoonists' Association for his work Heroes of the Eastern Chou Dynasty. He was the first foreigner to snap up the prize. Rex How (), president of Locus Publishing, which put out the book, said at the launch ceremony: "You want to know why Chen turns out to be so huge a success? It's just because he draws things that other cartoonists simply can't." Chen Uen, born in Taiwan in 1958, is an accomplished cartoonist and illustrator based in Zhuhai, Guangdong province. He has redefined the painting style of the commercial manhua (comic books) in Hong Kong, Taiwan and even Japan. His creative presentation of dramatic scenes are even believed to have influenced contemporary film directors. Chen cites the giant fist in Stephen Chow's Kung Fu Hustle as an example. Heroes is a manhua masterpiece applying all of Chen's innovative painting techniques. And Abi-Sword, produced before Heroes, has been Chen's laboratory for his experimentation. "Abi-Sword is my milestone," Chen says. "It's an important work in my career." When he was struggling to discover his own drawing style about two decades ago, he took inspiration from ink-wash works drawn by renowned Chinese painter Cheng Shifa. Thanks to his own solid painting background, Chen soon mastered the secrets of using calligraphy brushes to draw comic figures. In Abi-Sword, the ink lines help to create the poetic and intense atmosphere. He loves experimenting with new instruments. "The clusters of tiny spots that depict the flow of light and shadow were done by toothbrush. That was really interesting and effective," Chen says. After the success of Heroes in Japan, in which Chen extended what he has achieved with Abi-Sword, Chen found numerous followers of toothbrush drawing on subsequent visits to the country. Chen also believes a strong plotline is essential to creating a good comic. "The best cartoonists can tell a dull story in the funniest way," Chen says. "The ability to tell a story well is the first step to becoming an average cartoonist." Ma Li, who was only recently revealed to be Rex How, wrote the script of Abi-Sword. How has promoted works by cartoonists Cai Zhizhong, Zhu Deyong and Jimmy Liao, and has been following the development of Chinese manhua. How was reading Diamond Sutra, a Buddhist classic, when writing the martial arts-themed Abi-Sword. He added his understanding of Buddhist insights into the kungfu story. Abi comes from a Sanskrit word, meaning "the lowest inferno", and the Abi-sword is a legendary weapon that would bring ultimate power and destruction to the kungfu world. The story is mainly about young He Wusheng's quest for revenge, and his reawakening and salvation. The major theme is his realization of the truths of bitterness and happiness, suffering and gaining in the world. This unfolds against a backdrop of the hellish feuds within different kungfu schools. He is the man destined to put an end to all of this chaos. How thinks Chen has presented his script excellently. Even viewed by today's standards 18 years after its first edition, the manhua is still a "kungfu classic", How says.